Ikigai is a Japanese word and concept that roughly translates as the reason for one’s life. Author Anthony de Mello wrote about the concept in his book Taking Flight. De Mello wrote about exploring your responses to the four elements in the diagram below. 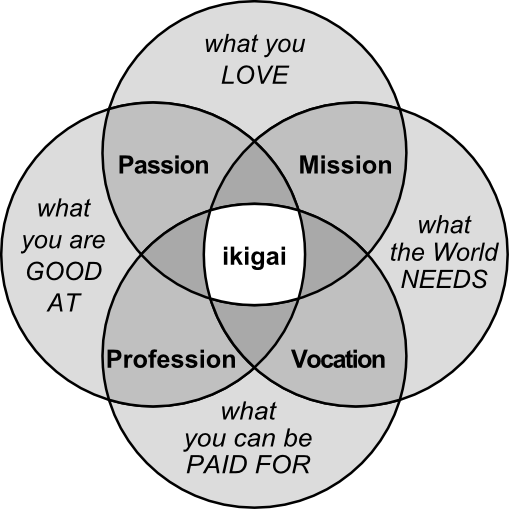 He said that where all four overlap is ikigai. See our definition of ikigai here. Enter a Celsius value and submit for Fahrenheit equivalent. When you call a number, a VoIP adapter logs on to a routing server. The VoIP adaptor is provided by your VoIP service provider. It might be a software program, a phone jack that plugs into your computer or a dedicated VoIP phone. The routing server looks up the IP number that’s associated with the destination phone number and makes the connection. If the destination number isn’t using VoIP, the routing server recognizes that the destination number is a Public Switched Telephone Network (PSTN) phone and routes the call through the traditional Public Switched Telephone Network. Learn more about the basics with our VoIP Security Guide. As VoIP becomes increasingly prevalent, so do the threats aimed at subverting its security. After all, letters IP in VoIP stand for Internet Protocol and that means attackers have a ready-made bag of tricks to pick from. How much do you know about the threats to VoIP security? Take our quiz to find out. A phishing kit is a do-it-yourself collection of tools that makes it easy for someone who lacks technical skills to launch a phishing exploit. The kit contains all the graphics, Web code, text and instructions the average person needs to put up a malicious website. Are you a Know-IT-All? Test your knowledge of tech vocabulary! This Web-based application for securely transferring funds was acquired by eBay in 2002. What’s the secret word? FACTA is an amendment to the Fair Credit Reporting Act. It was added to protect consumers from identity theft. What does FACTA stand for? What kind of security attack relies on human interactions? Security researchers have discovered a new phishing method that forces pop-up login messages to appear on legitimate banking websites. Ping is an Internet program that allows a user to verify that a particular IP address exists and can accept requests. This command line utility allows a user to track the hops a packet takes to reach its destination. What’s the secret word? TTL tells a network router whether a packet has been in the network too long and should be discarded. What does TTL stand for? What open source command-line tool for monitoring network traffic works by capturing and displaying packet headers and matching them against a set of criteria? Facebook is currently the most popular free social networking website. It allows registered users to create profiles, upload photos and video, send messages and keep in touch with friends, family and colleagues. Are you a Know-IT-All? Test your tech vocabulary! The official Facebook developers site allows developers to collaborate by using this type of server program. What’s the secret word? The Facebook API allows developers to add social context to their applications by incorporating profile, friend, page, group, photo and event data. What does API stand for? Storage as a Service is a business model in which a company rents space in their storage infrastructure to individual end users or businesses. In the enterprise, Storage as a Service is being driven by economic factors, as well as runaway data growth, compliance requirements, security issues and disaster recovery mandates. This is a conventional storage model, in which space is allocated beyond current needs, in anticipation of growing need and increased data complexity. On a storage area network, TP is a flexible storage allocation scheme where each user is assigned a minimum amount of storage space depending on what’s required for them to do their job effectively. What does TP stand for? What’s the name of Amazon’s Storage as a Service? Digital television (DTV) is the transmission of television signals using digital rather than conventional analog methods. Advantages of DTV include better resolution and compatibility with computers and the Internet. Analog television broadcasts are scheduled to stop in 2009. This term describes the relationship between the height and the width of a display. What’s the secret word? Where would you find an electron gun in your old TV set or monitor? An EPG for digital TV allows the user to interact with a guide to scheduled programming. What does EPG stand for? In 2008, Cisco announced products and applications to drive the market for enterprise video and digital television for business. Vorbis is an open source patent-free audio compression format, developed as a replacement for proprietary digital audio encoding formats, such as MP3, VQF, and AAC. Vorbis files compress to a smaller size than MP3 files, which reduces bandwidth and storage requirements. According to many reports, a Vorbis file provides better sound quality than an MP3 file of the same size. This word describes sound in the range that’s audible to humans. What’s the secret word? Does sound move more quickly through air or a solid? Vorbis is an audio codec. What does “codec” stand for? Serdar Yegualp explains how to deal with USB audio problems, such as stuttering and glitching. Are you a Know-IT-All? Challenge your knowledge of tech trivia, IT acronyms, online slang and enterprise technology with this blog from the editors of WhatIs.com. Three new questions, every weekday.